A groupof bloodpsattered, smelly adventurers came into a bar...and people actually NOTICED! This installment of Flaming Crab Games’ delightfully oddball Letters-series clocks in at 23 pages, 1 page front cover, 1 page editorial, 2 pages of SRD, leaving us with 19 pages of content, so let’s take a look! As always, we begin this installment with a nice letter from the planeshopping vessel, thankfully salvaged for our collective delights by J Gray. Now we’ve all been there: The PCs have just battled through a horde of foes, are covered in blood and guts…and then, they walk into a tavern. As if that does not look weird. And no one cares. We begin this pdf thus, appropriately, with a nice and handy table pertaining social modifiers – these can be added or subtracted, depending on the context, from the respective social skills: A foppish Taldan dandy may indeed consider someone covered in gold dust to warrant +4…while the savage orc chieftain will be more inclined to hand an asswhooping to the pansy that came before him thus clad. This includes filth/bathed-status and perfumes, including race-specific ones as well as notes on hair/beard-care or the status of one’s teeth…which were notoriously problematic before the advent of modern dentistry. And indeed, hygiene may influence a lot: Disguises that do not correspond to expected hygiene levels may suffer from a penalty; whether fleas or bedbugs, lack of cleanliness may net you itching, annoying parasites. (Yep, provided as a nice infestation) and concise and simple dental cavity rules allow you to track bad breath et al. Similarly, a handy table pertaining body odor and how easily you may be tacked via scent etc. can be found. And yes, you may actually develop a disgusting stench aura! Now, the medieval period had a significantly different concept pertaining hygiene than we do: Performing the act of love on piles of mist was not uncommon – the offal and straw kept heat pretty well. Similarly, throwing the bedpan on the streets was pretty much common practice prior to the advent of proper sewer systems. At the same time, though, this time wasn’t as filthy (or prude!) as you’d imagine – in Nuremberg, for example, the existence of bath houses is well-documented. They were a space for citizens to relax, consume food…and yes, also indulge in more carnal activities, much to the chagrin of many a hardliner or prude. The exact structure and conventions of places related to bathing differ wildly amid cultures – and thus, much to my delight, we receive several fully mapped bathhouses: The Ishiyu Onsen hot spring with a feudal, Japanese touch; the quasi Greco-Roman Thermae of Pulsatilla and the White Blossom Bathhouse, which should make fans of WuXia or European bath culture both happy – the respective entries also feature notes on nomenclature, showing that the team did the research. Nice! Obviously, though, hygiene on the road would be a slightly more difficult subject matter – and here, we receive the also fully mapped cascade pools, which may draw washers (or make for a phenomenal boss-fight arena). A barber shop and a salon further complement the ready to drop in locales (again, mapped) that are depicted within, all with adventure hooks…though frankly, i would have enjoyed an acknowledgment of barbers doubling as physicians and the type of “healing” they provided. Editing and formatting are very good, I noticed no grievous glitches. 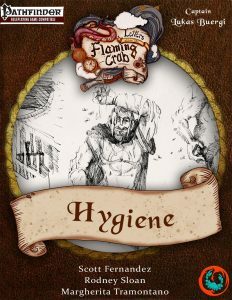 Layout adheres to Flaming Crab Games’ two-column full-color standard and the pdf comes fully bookmarked for your convenience. Artwork is a mix of b/w-art and stock and manages to generate a concise visual identity. The maps provided for the locations are generally minimalistic and b/w with blue and green highlights – though none of them sports notes on their scale. I am a bit disappointed that none of the maps, but in particularly the cool cascade map, has a player-friendly version sans keys. Lukas Buergi’s installment on hygiene can be a godsend for intrigue-heavy campaigns, particularly those favoring a simulationalist approach…like mine do. Personally, I enjoy this VERY much. That being said, the lack of player-friendly maps does hurt this a bit…and so does the fact that frankly, the component of magic in such a context deserved: While prestidigitation and the like are acknowledged and talked about, I wished that this took the fantastic angle up a slight notch. While I adore the sample bathhouses included, general toolkits for the design and development of hygiene traditions would have made more sense to me – you know, sand baths, cleaning by fire for fire resistant beings…the like. The bathhouses can be used once…a general toolkit could be used all the time. Similarly, suggestions for culturally specific social modifiers based on hygiene or uniquely elven/dwarven/weirdo race xyz-suggestions for traditions would have elevated this further. The pdf, as a whole, is a more than fairly-priced, evocative file and deserves being bought, even if it does not reach the level of depth and coverage that the coin-installment offered. In the end, this is pretty much a good buy and should be considered, particularly in light of the topic not nearly being covered in its totality – and weird little books like this require and deserve support! If you’re like me, you’ll really enjoy this…but as a reviewer, I can’t go higher than 4.5 stars, rounded down on this one. You can get this creative, cool little supplement here on OBS and here on tabletoplibrary.com!